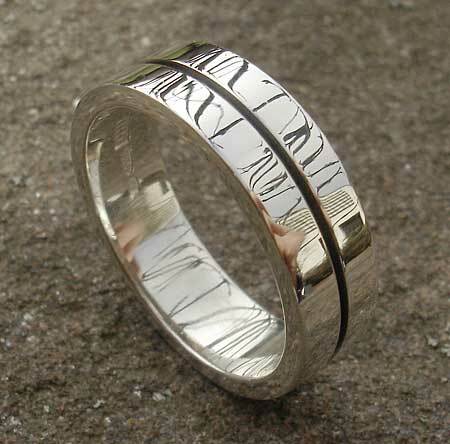 Silver Contemporary Wedding Ring : LOVE2HAVE in the UK! 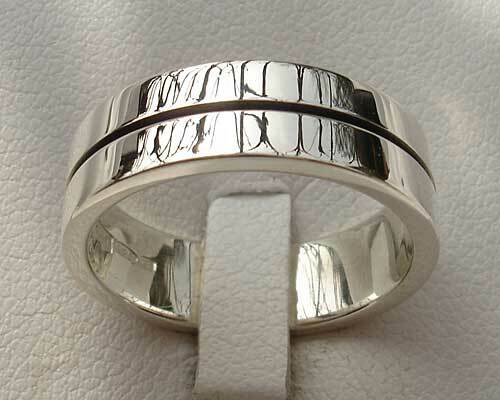 A UK made, solid sterling silver wedding ring for men in a flat profile that features a single black etched line that runs all the way around the rings outer and positioned centrally. The line cuts into the silver like a thin groove. We think this wedding ring design has a very sleek contemporary clean-cut style and something that could be worn in an office environment every day, especially with a suit. The highly polished surface further complements the clean-cut styling. The available widths are 6mm, 8mm and 10mm. The 6mm is pictured. The ring is made to the highest of quality standards and designed to feel comfortable. Width(s) Available: 6mm - 10mm.